ONE problem with renewable energy is that neither the wind nor the sun is reliable. That cannot, however, be said of the tides. The Newtonian clockwork of sun and Moon can always be relied on. The problem with exploiting tidal power has, rather, been finding places to do it efficiently: bays or estuaries with a suitable tidal reach and a topography that permits a barrage to be constructed. Only then, with established designs, can turbines be installed through which the tide can ebb and flow. That would change, though, if turbines could simply be attached to the sea floor. And several firms are trying to make it so. Some, such as Andritz Hydro Hammerfest, in Norway, and Marine Current Turbines from Bristol, in Britain, take the relatively simple approach of sticking what are little more than strengthened wind turbines onto the seabed. In the case of such turbines, though, bigger is better. And, since a turbine is not much use if its blades stick above the surface, that means they need to be located in reasonably deep water. Which is a shame, because a lot of otherwise-suitable sites are too shallow. Not all wind turbines work this way, though. Some smaller ones are skeletal cylindrical structures whose axes of rotation are at right-angles to the direction of the wind, rather than aligned with it. And that, with the important modification that this axis is horizontal rather than vertical, is the basis for several novel designs for tidal-power generators which can operate in shallow water too. Engineers at Ocean Renewable Power Company, in Portland, Maine, and Kepler Energy, in London, both use this approach. And Ocean Renewable is starting to commercialise it. In September 2012 its TidGen generator was deployed in the Gulf of Maine. It thus became the first plant to deliver offshore-generated power of any kind (wind, wave or tidal) to an American electricity grid. Kepler is a little behind, but is hoping to try out a full-scale version of its Transverse Horizontal Axis Water Turbine in the Bristol Channel soon. Its engineers’ calculations suggest this device will generate 50% more power from a given tidal stream that a conventional turbine can manage. Nor are such submarine waterwheels the only new approach. Engineers at Pulse Tidal, in Sheffield, Britain, have decided to use hydrofoils rather than turbines. A hydrofoil is, in essence, an underwater wing. As water flows past it, the current generates lift. Pulse Tidal’s hydrofoils are mounted in such a way that this lift causes the ’foil to nod up and down. Since it is attached to a generator, that nodding generates electricity. 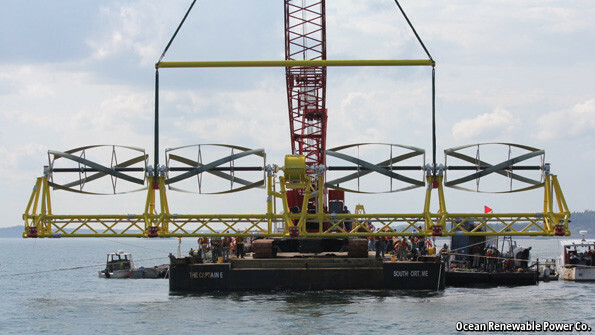 Even with innovations like these, tidal power has a long way to go before it becomes an important source of electricity. The wet, salty environment of the ocean is a hostile (and expensive) place for mechanical engineering to work. But if it can be made to do so, the lure of a reliable, free fuel source may mean the seabed eventually becomes littered with tiny power stations.